A baseline is generically known as a value or condition against which future measurements can be compared. Within the context of project management, these values and conditions are the project’s scope, cost and schedule. A project baseline can be thought of as a “snapshot” of a project’s initial condition, just before work begins. Baselines are used to evaluate project performance over time, by comparing an initial project snapshot with any subsequent images captured while your project progresses. Baselines are also used to quantify any variances from the original plan while the plan is in motion. You can also think of a project baseline as a “sanity check,” in the sense that project sanity is defined as not making the same mistake over and over again while hoping for a better result! Most decent project management tools have a feature for capturing the initial baseline and displaying any variances from that initial line in the sand. Project Plan 365 & Microsoft Project are no exception. Both can store and display up to 10 baselines for any given project (or for a select group of tasks). The typical baseline metrics most project managers use are: baseline duration, work and cost. However, many other metrics can be defined and then displayed. When setting up a project plan, it is important to remember to set the initial baseline before putting the schedule into play. In other words, this step needs to be taken before work begins, but after you have designed your project plan and when you are ready to roll. Note: Forgetting to set an initial baseline is a common mistake, and this boo-boo can’t easily be rectified once your plan is in motion. 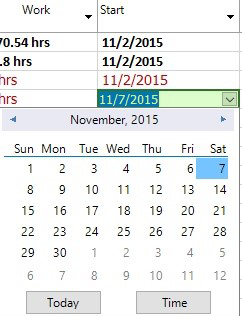 Variances (baseline shift) are shown in baseline fields and on the Tracking Gantt chart. Baseline shifts are an important indicator of project performance over time and should be employed by every project manager when evaluating project metrics. To begin implementing baselines within your plans, simply subscribe to Project Plan 365 today! Over the past decade or so, the concept of ‘cloud’ has become synonymous with a place where we store all things work-related (such as documents and data). In many cases, a ‘cloud’ represents the place where we work (i.e. within a digital workspace like SharePoint or Project Plan 365). For project managers, we often speak in fluffy terms that reflect this new atmospheric characteristic of the modern workplace: “…just put that in cloud” is common geek-speak for putting any bit of communication or data in a place where everyone else can get to it. However, how many of us really understand this amorphous reference to a metaphor taken straight out of metrology? While developing a new file-storage option rolled out in Project Plan 365 (a popular look-alike to Microsoft Project), we gained insight into the common understanding (and misunderstanding) of what the ‘cloud’ means to everyday project managers. Sorin Fiscu (CEO of Housatonic Software) explains: "While my team was analyzing user trends for tens of thousands of project managers, only a tiny fraction of the user-base was implementing a cloud storage system." He wondered why, so this article explores why individual PMs and organizational PMOs have not embraced the cloud as wholeheartedly as other professionals, such as programmers, engineers, marketers, etc. who are all working in legitimate cloud-computing environments. Eric Griffith (Feature Editor @ PC Magazine), extolls that the ‘cloud’ is nothing more than a buzzword and is not really new – especially if you were born after the invention of the internet. Eric explains that the ‘cloud’ is the internet, for all intent and purposes. He also points out that the cloud is not an upgrade to your hard drive, and is not about attaching a NAS (network-storage device) to your company LAN (local area network) and calling it a cloudy day. Instead, Eric enthusiastically explains that the cloud is really a paradigm shift in computing (call that cloud computing), and that this shift fundamentally changes the way we approached all of our work within a computing environment. Well, obviously he was right, as 2016 was the year that Microsoft introduced Planner and made OneDrive for Business a key component within the Office 365 suite. In essence, these and other additions to Office 365 (like Project Online) signify a shift away from terrestrial computing as we know it – away from using Microsoft-Project standalones like Project Server and SharePoint to something seemingly more ethereal and out of our control…something somewhere up in the clouds. As the Office 365 concept portrays, we are not just saving bits of information or knowledge to the collective. We are actually using software that does not exist on earth as we know it, such as on our computing devices in the form of apps and programs. Instead, we are now in the realm of Software-as-a-Service (SaaS), which means you no longer “own” computer programs, but rent them instead. In many cases, you never install anything on your computing device, but just log into the service using whatever web browser you have at hand. Organizations that currently deploy Microsoft Servers in-house (SQL, SharePoint, and the Project Web part), are considering (or being pushed) into moving all of that out of the organization’s IT basement and into the cloud using the Microsoft Azure offering (which is essentially the setup shown in Figure 1 above). This takes your entire company’s IT setup and moves it offsite and upwards into a stratosphere owned solely by Microsoft, but rented to you and your company on a per-seat basis. So, what’s not to like, a good planner will ask. The major inhibitor (in our opinion), is that this is a huge change in the way that we have used computers in the past to plan out our projects. And as some planners rightly equate, change means re-work, more expense, and in general, more headache. But, change is what we are good at, no? Another inhibitor for smaller PMOs and organizations with just a handful of planners is that all of the above may seem overkill when trying to meet the bottom line and come out with more green than red at the end of the year. Many dozens of dollars per person per year may seem like a lot when all is said and done. Training people on new software, and setting up access for all to experience the wonders of cloud computing, may also be prohibitive in the middle of a busy schedule. Another concern heard most is security and privacy. PM may ask, if my data is in the cloud, can’t it be hacked easier than if on my company’s local network? Well, one has to just look at the Equifax breach, the Sony breach, or any other security or privacy breach over the last few years. Do you really feel safer with your project data on the ground, rather than, say in a Microsoft-controlled cloud? With some of your concerns heard, let’s harken back to the fact that most all projects endeavored either fail or partially fail in the world today. Perhaps there is one big reason to switch to a total cloud computing environment – to succeed! 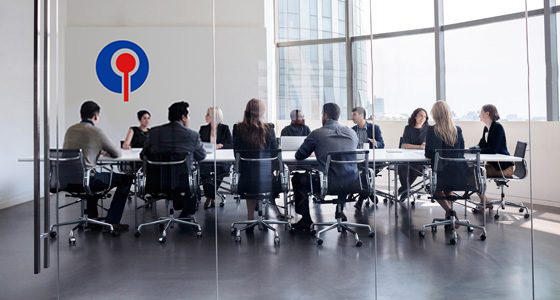 To help subscribers of the Project Plan 365 Business (PMO) or Enterprise (EPM) plans succeed, we have included access to a secure, private cloud for all of your project data, and that's called Drive 365. 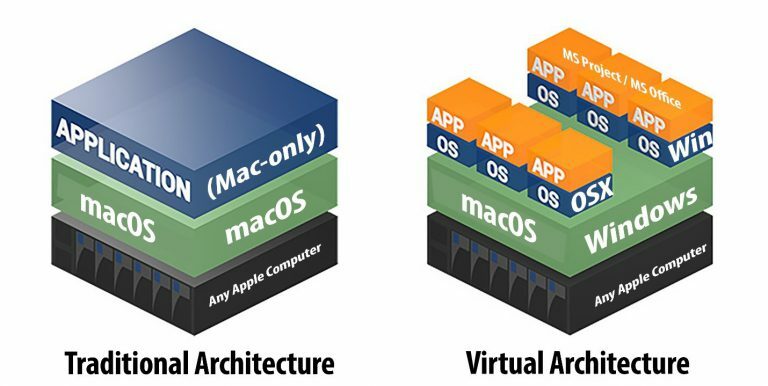 This is a much simpler way to implement cloud computing (as show in Figure 1 above). With Drive 365, the entire concept is condensed; part of our service to you is to store your critical project plans (those that relate to your project portfolio) safely and securely. In this way, not only are portfolio statistics generated automatically, but you don't have to worry about where any of your critical files are, or if they are safe from prying eyes or not. And you don't need to understand anything else. During this blurb on cloud computing, we have discovered that “let’s put it in the cloud” means much more than just storing your MS project file on OneDrive or Dropbox. We also see now that there are a few different tiers within modern cloud-computing: there is one tier where you or your organization use SaaS offerings to collaborate on project planning, and then there is the more extreme tier where most of your IT department is displaced by PaaS. In this case, all those servers and mysterious doo hickeys once housed in your IT basement are now gone, leaving you with more party space when it comes time to celebrate your project success. And if you need an instant cloud environment, all that's needed is a subscription plan to Project Plan 365. To give PM cloud computing a try, simply try us out free for 30 days! During the formulation and implementation of your team’s project schedule, your team has most likely discussed the budget, and might have asked the following: how much money are we going to spend? How is the money to be spent? What happens when new costs arise…how are those added in? How much have we spent to date? More or less, how much are we off from our initial budget projections? These questions and more are all questions that Project Plan 365 (or Microsoft Project, for that matter) will answer for you, provided that costs are entered into the application. 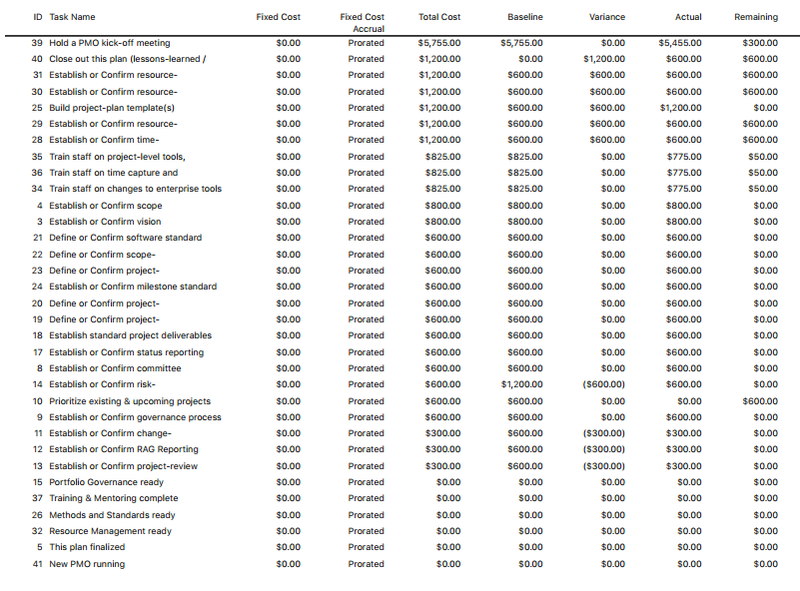 This simple exercise of entering costs into your project plan will help you ensure the fiscal health of your projects. After all, no one wants a project to come in overbudget, or worst, cancelled midstream due to a lack of funding. Many schedulers don’t have the ability to track costs (for example, with Wrike and many other popular PM services), or have a separate app or spreadsheet for that, or don’t see the need or simply don’t know how. In PM parlance, that’s a big boo boo; but one that can be easily corrected by following this golden PM rule: always connect the cost of the resource used for any bit of work, with the task itself. 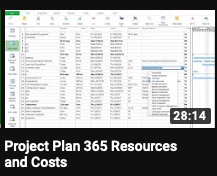 Even if your organization has an entire department that handles the finances (and perhaps has their own software to do just that), you should still enter in the costs of resources within Project Plan 365, and also refine these costs over time as they change. This ensures that your project plan is a one-stop shop for both scheduling and financial data – you get the complete project picture! Before applying that golden PM rule however, we need to understand how costs are handled within the software. First, think of people as having an associated cost (salaries, consultant fees, vendor charges, etc.). Also, think of materials as having costs associated with each, for example, the price of a palette of bricks, a stack of windows, computers, a desk or a chair. In addition, think of services that can incur costs over the life of a project, such as utility bills or travel expenses. Work: people, equipment or facilities costs, in terms of rates per hour or cost per use. Select this resource type for people / equipment / facilities that are assigned to a task, but are not consumed during the task. Material: material costs, in terms of a standard rate or a cost per use. Select this resource type to track consumable resources, such as bricks or food stuffs – for things that are used up during the project. Cost: everything else, in terms of a single one-time charge. Select this resource type to track budgetary items such as travel costs or phone bills that are not dependent on the amount of work done, or on the duration of a task. 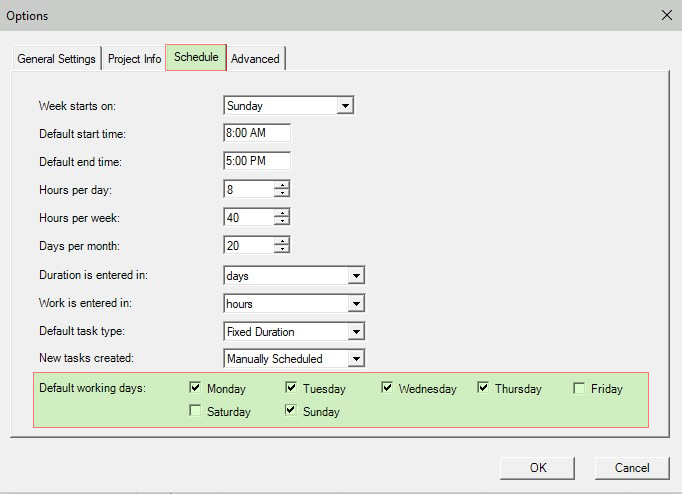 Within any schedule of work, Project Plan 365 automatically calculates the total cost of your project based on your input of resource costs, and the software also flags any variances from your initial budget, as your project progresses over time. In other words, the software calculates how much you planned to spend, are spending now, and how much you’ve overspent or underspent at any given time, or on any task. It's up to you (as project manager), to determine what costs to track within your project plan, and how. For example, is employee travel tracked or not, or do you want utility bills to be added to the cost of the project? In other words, the granularity of cost tracking is determined by you, the PM; with the level of granularity determining how accurate your cost projections can be (down to the penny, or in much larger round numbers). Note: If you just want to use the fixed cost column to track costs (i.e. you don’t plan on renting equipment or buying materials by piece, then you don’t need to add the material resources in the resource sheet as described in the following tutorial. For more on this method, see "Using the Fixed Cost Field..." immediately following the tutorial. 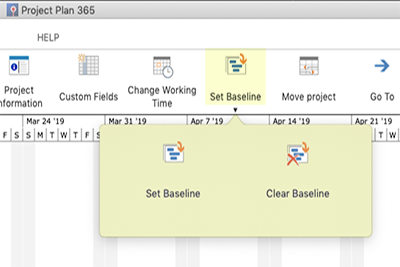 If you want to follow along using Project Plan 365, go to the Backstage and select New / New PMO to open up a copy of the template used in this tutorial. Now that we understand costs from a software perspective, let’s add a few of each type to a project plan, either your own or one of ours. All resources should be entered into the Project Plan 365 (or Microsoft Project) Resource Sheet. This resource-related spreadsheet has default columns displayed for entering in the Resource Name, Type, Material Label, Initials, Group, Max Units, Standard and Overtime rates, Cost per use rate, Accrual rate, Base Calendar, and a column for a Code of some sort. 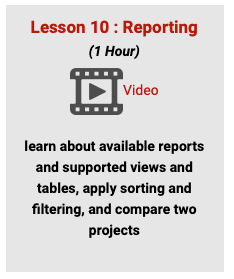 In this tutorial, we will cost some resources and begin to budget a project plan, understanding that the financial picture only becomes clear after we apply costed resources to specific tasks within the plan. After entering the Resource Name, change the Type to Material and enter the Cost / Use for the material. 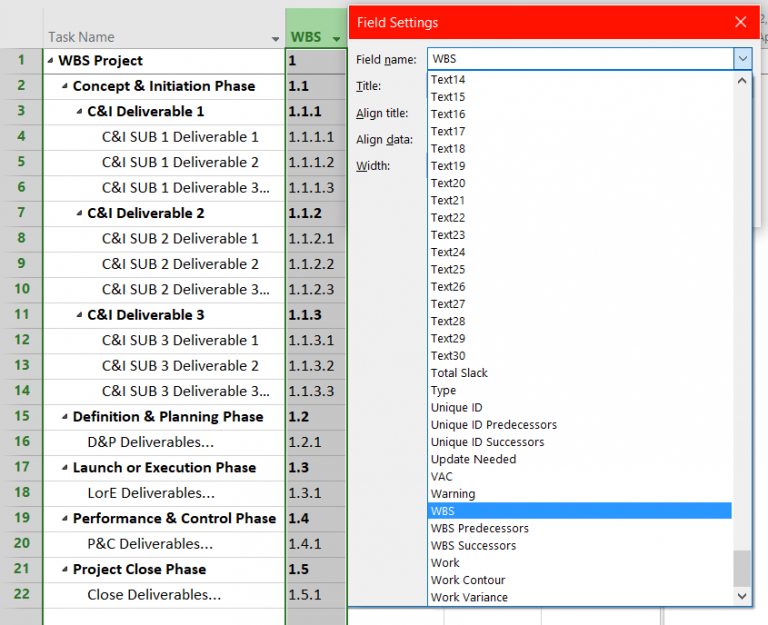 Now to complete the Resource Sheet, you would enter in all the Work and Material type resources as required by the task list (see Gantt View, and tasks that require resources). For costs associated with budgetary items such as utility bills or travel expenses (items that do not depend on the work or duration of tasks), you need to enter the name of those costs here; but you won’t be able to enter in the actual cost, just a descriptive name. (See step 6). 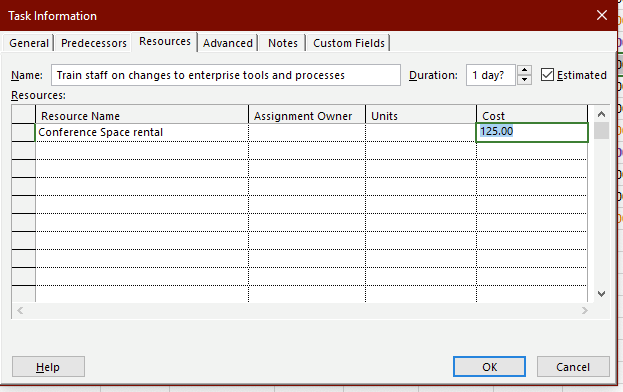 To enter in Cost/Use values, you need to flip over to a task list view (such as the Gantt View), to assign this type of cost to the work being done. For example, select the task where the cost incurs, and then use the Task Information popup to enter in the cost of the resource(s) selected. Do this for all planned expenses not dependent on work or task durations (Cost) – AND - also assign all other resource types (Work and Material) to tasks in the plan, where appropriate. 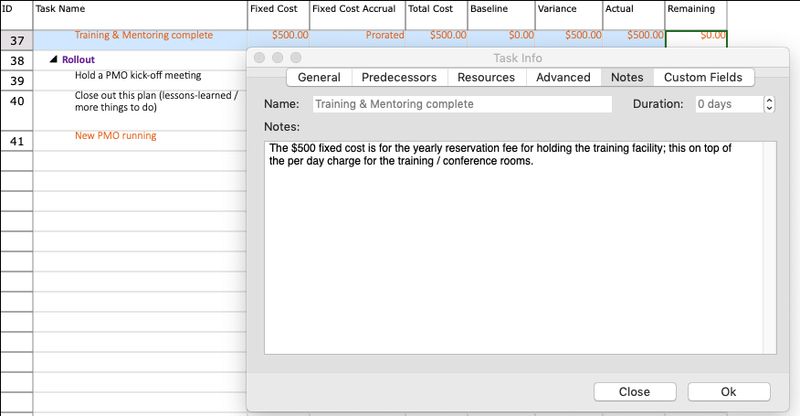 It is a best-practice to use the Notes tab (Task Info pane) to annotate what the fixed cost is about. Once entered, these fixed costs are added to your mix of resource and other costs as represented in the Resource Sheet. Now that you have entered in all the costs that you want to track in your plan, a “baseline” or record of your initial thinking must be captured. Doing so allows you to later look back, and see what you had planned to spend, vs. what you actually spent. (Someone will always ask. 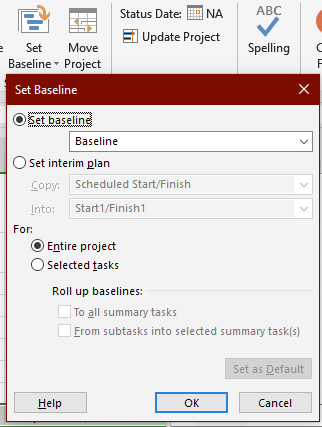 )To set a baseline, navigate to Set Baseline on the Project ribbon, and select For Entire Project. Once a baseline is set, you can begin tracking costs as they occur, in terms of baseline costs, actual costs, and remaining costs. In addition, as your project progresses, you can produce budget reports in a variety of formats and for a variety of purposes… no need to use Excel! See our complete library of training materials for beginning-to-end lessons on doing all that matters to a PM. 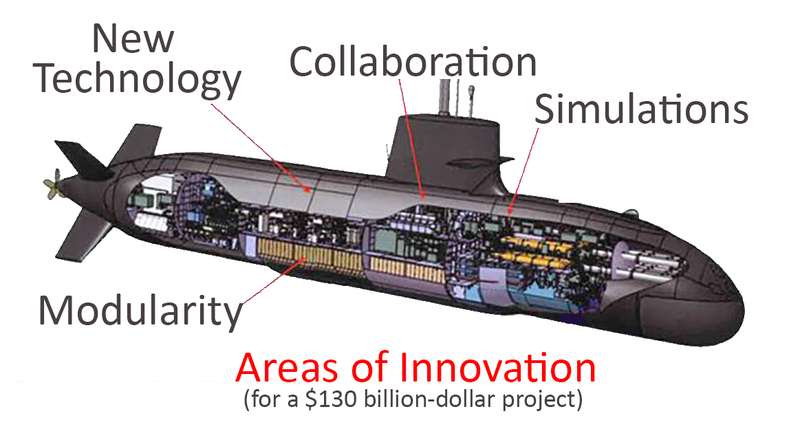 To sum up, we’ve entered in all three types of costs: Work, Material & Cost for every resource in a project plan, and then assigned those costed resources to appropriate tasks in the plan. We also explored using the Fixed Cost field for costing items outside of the Resource Sheet. You can apply this fiscal strategy to new plans being created (for example, to calculate cost projections) or while plans are in progress, i.e. to add additional costs not planned. This wealth of cost data also comes in handy after projects are completed, as you can see from the data how much you overspent (or underspent), and where! This strategy of always costing your plans within Project Plan 365 (or Microsoft Project, for that matter), gives managers and project teams real-time cost data that can be used when making financial decisions during project rollout. For more information on making your project plans viable, see our website. To try out Project Plan 365 for free, download the 30-day trial; and if you are interested in better software for your Project Management Office (PMO), don’t forget to check out our Business (PMO) subscription plan. When we first started out with our viewer tool, we were mainly focused on providing users with a new and better way to view their Microsoft Project plans (.MPP files). Since then, we have provided our users with a simpler way to edit Microsoft Project plans, no matter what platform or device they were using. Now, we are adding function to our apps that go well beyond the functions and features currently found in Microsoft Project 2019 (all the while remaining completely compatible with .MPP formatted project files). Hence, our new logo and added slogan now represents how we @housatonic feel: as project managers, you are key. We are here to help you get your projects done in the most efficient and effective way possible, by providing you the best in PM technologies. Consider our new logo: abstractly, you are the red key surrounded by our technology. We are here to help you unlock your potential as a PM, by providing you with cutting-edge tech and reliable support. Stay tuned to this blog for upcoming announcements of features that provide better risk management, AI-assisted PM and other functions that will help you go beyond what you can do inside of Microsoft Project and our apps. If you haven't already, download the latest version of Project Plan 365 to try out new features, like Real-time Collaboration. Are you frustrated with spreadsheet-based project plans? Spreadsheet applications (such as Excel) are generic tools that need to be customized to be useful (for example, when formulas and/or macros are written to calculate project data). Some spreadsheet applications (such as Excel), are difficult to share with the project team, and these critical project files face problems when emailed or networked with other users. Excel does not store baseline data on how your plan has changed over time. In fact, there is no log of changes whatsoever, unless you create one on your own. Excel does not calculate critical paths, unless you program it to do so. Excel does not automatically create Gantt charts, and creating one from scratch is an exercise in futility as data changes over time. Excel does not automatically track resources, thus keeping you in the dark over time. Excel does not have canned reporting tools geared for project management; for example, for creating milestone, budget or resource reports. Smartsheet does not allow individual calendars for individual resources used within your plan, so precise time management is near impossible. Smartsheet does not facilitate project budgeting, as there is no way to track what the cost of people or material resources are costing during the life of your project. Smartsheet does not allow for offline editing of your plan, at least not without a lot of file manipulation and make-work. Smartsheet (and other online PM tools) are walled-off gardens, inhibiting the quick growth of teams and making common cloud-file sharing that more difficult. Both Project Plan 365 and the more expensive Microsoft Project are highly capable and proven PM tools that work for any type of project imaginable, and with little tailoring or setup time. Both of these PM apps provide the project manager with a feature set that covers any need during the life of a project – from custom reporting to advanced budgeting and calendaring – to the precise tracking of tasks, resources and costs. Either are excellent choices… but what if you didn’t have to choose at all? In reality, you don’t. You can use either of these great apps interchangeably with your project files – files created in one or the other! That’s because both tools use a common file format (.MPP). The .MPP file format has been around for decades, and is probably the most popular container of project data in the world (outside of spreadsheets). The .mpp triad - use Project Plan 365 to open files anywhere, on anything! For example, say you start out with a small project team using Project Plan 365, and your team builds a portfolio of projects. Then say in the future, your small team hooks up with another team of planners using Microsoft Project, and would like to contribute to your established portfolio of plans. 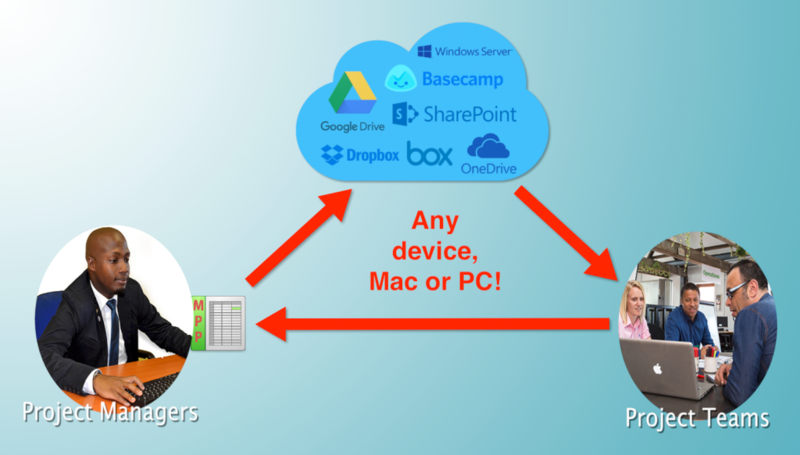 Not a problem; as both teams can share their files and exchange them back and forth with no effort at all. (Something that the more expensive Primavera cannot do). This compatibility allows small project teams (or smaller orgs) to grow into larger enterprise teams without any rework whatsoever. However, Project Plan 365 works well for small or large enterprises equally as well. 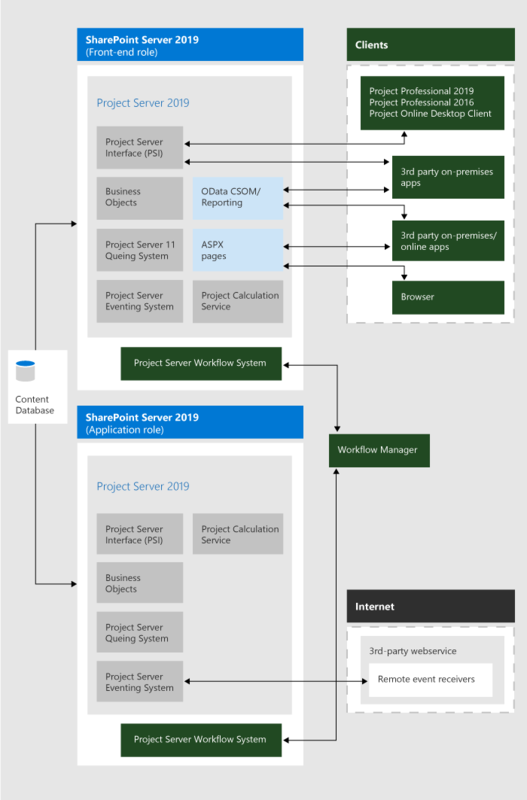 That upward migration to the more expensive-per-seat Microsoft Project would only be needed if a feature or function is required that exists only in Microsoft Project; of which there are just a few exceptions (see this comparison chart for details on the differences). Also see this blog post by CEO Sorin Fiscu on leveraging your Microsoft Project investment for those thinking of a mixed environment that includes both Project Plan 365 and its big sister, MS Project. 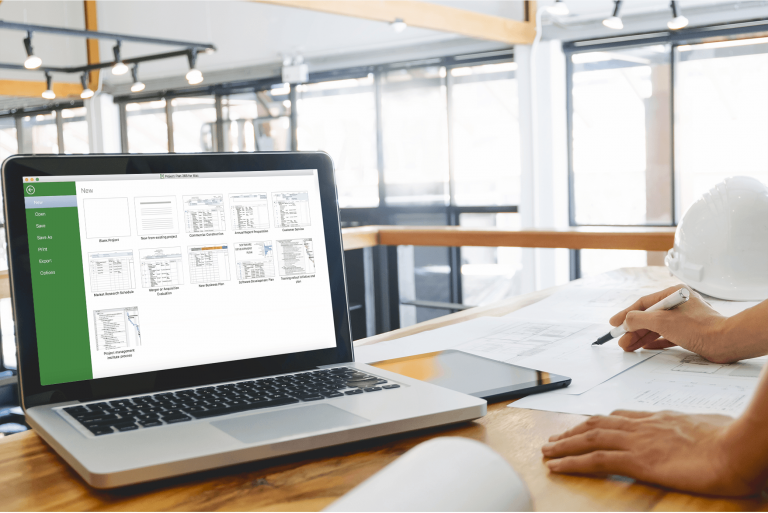 To start planning without using a common spreadsheet app, and to begin weaning off inefficient and ineffective project spreadsheets, download a 30-day free trial of Project Plan 365 - you'll be planning better in no time!